Garnet Valley celebrates beating Nashaminy 51-48 to advance to the PIAA Class 6A finals in Hershey. Plymouth Meeting, Pa., Monday, March 18, 2019. Garnet Valley celebrates beating Council Rock North, 47-45, to advance to the PIAA Class 6A state semifinals. Garnet Valley’s historic season ended in the state championship game despite Brianne Borcky’s best efforts. The Drexel recruit led the Jaguars with 21 points, and Emily McAteer, the school’s all-time leading scorer for both the boys’ and girls’ basketball programs, added 15 points. McAteer, a Loyola University of Maryland recruit, said making the state final was her biggest accomplishment. Other local teams with strong showings in the bracket included state semifinalists Neshaminy (12-0 in the Suburban One National), led by the senior duo of Allison Harvey and Brooke Mullin, and Upper Dublin (13-1 in the Suburban One American), which was paced by 6-foot-3 center Jackie Vargas. Abington (13-1 in the Suburban One American), Cardinal O’Hara (8-4 in the Catholic League), and Council Rock North (10-2 in the Suburban One National) all made it to the quarterfinals in states. Archbishop Carroll (11-1 in the Catholic League) made it all the way to the championship game, where they fell to Charters Valley. The Patriots dominated the Catholic League, finishing 11-1 overall, and capped their season by beating Archbishop Wood (9-3 in the Catholic League) in the league championship game at the Palestra in overtime. Carroll met Wood again three weeks later in the state quarterfinals, where the Patriots cruised to a 63-48 victory. Then, to reach the state final, the Patriots had to grind out an overtime victory over Southern Lehigh. Drexel recruit Erin Sweeney and the senior leadership of Mary DeSimone and Harlem Jennings led the Patriots all season. Abby Walheim finally found out what it was like to win a championship. The senior forward had lost five championships during her career at Villa Maria, but she broke through as the Hurricanes defeated Mount. St. Joseph’s in the District 1 final at Temple University. Villa Maria carried the momentum into states, making quick work of Elizabethtown and Twin Valley, but wound up losing to Southern Lehigh in the quarterfinals. The Hurricanes were led by Walheim, a Villanova lacrosse recruit, and Paige Lauder, a Columbia basketball recruit. Radnor, Springfield Delco, West Chester Henderson, and Pope John Paul II all lost in the first round of the state playoffs. Mount St. Joseph won one game in states and had the toughest road to even qualify as the Magic were the No. 12 seed in District 1. Bonner-Prendergast's Maeve McCann leaves the game late in the fourth quarter after fouling out against Bethlehem Catholic in the PIAA Class 4A semifinal. Bonner-Prendergast lost, 64-50. Bonner-Prendergast (8-4 in the Catholic League) fought its way back from a deficit but had its season come to close against Bethlehem Catholic in the semifinals of the state playoffs. Senior guard Maeve McCann, a Jefferson recruit, paced the Pandas with 15 points, including 11 in the second half. Junior guard Dakota McCaughan and sophomore forward Ariana McGeary added eight points apiece. Lansadale Catholic (5-7 in the Catholic League) and Gwynedd Mercy both fell in the second round in the state playoffs. Lower Moreland (11-1 in the Bicentennial Independence) lost to Bishop McDevitt-Harrisburg in the first round. Neumann-Goretti's Diamond Johnson has become one of the area's top players. Neumann-Goretti (11-1 in the Catholic League) and Imhotep Charter had a chance to face each other in the semifinals of the state playoffs. But it didn’t happen as both got knocked out in the quarterfinals. The four-time defending champion Saints lost to Dunmore, and the Panthers lost to Trinity, which ended a run of five straight state championship appearances for Imhotep. Nadjy Tyler of Imhotep Charter poses with her piece of the net. She was named the MVP in the victory over Audenried in the Public League championship game. The Panthers won the Public League championship over Audenried, and Nadjy Tyler, a Dayton recruit, earned MVP honors. St. Basil had its perfect season ended by Dunmore in the second round of the playoffs. Like Neumann-Goretti and St. Basil, Constitution also had its fate decided by Dunmore in the first round of states. Sacred Heart beat Paul Robeson in the first round of the state playoffs, but Sacred Heart lost in the second round. GAMP, District 12′s No. 2 seed, lost to Old Forge in the first round. Jenkintown (14-0 in the Bicentennial Constitution) ended its season in the state semifinals, losing to Lourdes Regional. 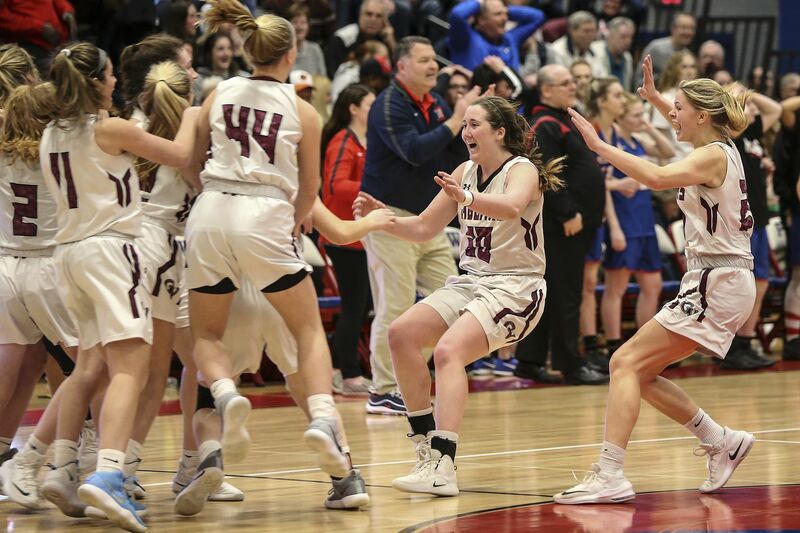 In a quarterfinal win over Susquehanna Community, Carly Mulvaney netted 21 points, while Natalie Kolb sank four clutch free throws to maintain the Jenkintown lead. Germantown Academy players celebrate after winning the PAISAA basketball championship in February. Germantown Academy, which won the Inter-Ac League by going undefeated, topped Shipley for the independent schools championship to complete a 30-1 season in which the Patriots were ranked as high as No. 18 in the country by MaxPreps. Their only loss was to Miami Country Day School in January. Shipley, led by Anna Camden, beat Abington Friends to win the Friends School League title. Camden became the program’s all-time leading scorer in January. Anna Camden (right) plays defense against Germantown Academy's Elle Stauffer. Rounding out the PAISAA final four was Penn Charter, paced by Carmen Williams, and Abington Friends, which took the Patriots down to the wire in the semifinals, losing on a game-winning layup from GA’s Jaye Haynes. Mihjae Haye led a balanced attack from the Kangaroos. Elle Stauffer of Germantown Academy is followed by Elizabeth Talluto of Shipley. Garnet Valley's Brianne Borcky (42) blocks a shot in the PIAA District 1 Class 6A semifinal. Abington's Kassondra Brown has committed to the University of Rhode Island. Neumann-Goretti's Diamond Johnson is a top ball handler. Garnet Valley was led by dynamic duo Brianne Borcky (left) and Emily McAteer. Taliyah Rahman of Audenried dives for a loose ball against Imhotep in the Public League championship game.